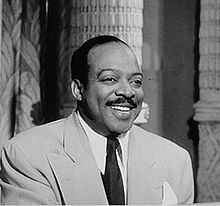 William "Count" Basie (August 21, 1904 – April 26, 1984) was an American jazz pianist, organist, bandleader, and composer. He was one of the most important jazz bandleaders of his time. He led his popular Count Basie Orchestra for almost 50 years. Many important musicians came to became popular and successful with his help, like tenor saxophonists Lester Young and Herschel Evans, trumpeters Buck Clayton and Harry "Sweets" Edison and singers Jimmy Rushing and Joe Williams. Basie's famous songs were "One O'Clock Jump" and "April In Paris". William James Basie was born in 1904 in New Jersey. His parents were Harvey Lee Basie and Lillian Ann Childs, who lived on Mechanic Street in Red Bank, New Jersey. His father worked as a coachman and caretaker for a rich judge. After automobiles (cars) became more popular than using horses to get around, his father became a groundskeeper and handyman for some families in the area. His mother was a piano player and she gave Basie his first piano lessons. To earn money, she took in laundry to wash and baked cakes for sale. Basie was not very interested in school. He dreamed of a traveling, inspired by the carnivals which came to town. He only got as far as junior high school. He helped out at the Palace theater in Red Bank, to get into the shows for free. He also learned to use the spotlights for the vaudeville shows. One day, when the pianist did not arrive in time for the show, Basie played instead. He soon learned to improvise music for silent movies. Basie was very good at the piano, but he liked drums better. There was another drummer in Red Bank who was better, called Sonny Greer, so Basie stopped playing drums and just played piano. They played together until Greer started his professional career. Basie played with different groups for dances, resorts, and amateur shows, like Harry Richardson’s "Kings of Syncopation". When he was not playing a gig, he spent time at the local pool hall with other musicians. He got some jobs in Asbury Park, playing at the Hong Kong Inn, until a better player took his place. Around 1924, Basie went to Harlem, New York City. A lot of jazz was being played there. He liced down the block from the Alhambra Theater. Soon after he went to Harlem, he met Sonny Greer again, who was now the drummer for the Washingtonians, Duke Ellington's early band. Soon, Basie met many Harlem musicians, like Willie "the Lion" Smith and James P. Johnson. Basie toured in some acts between 1925 and 1927, as a soloist and accompanist to blues singers Katie Krippen and Gonzelle White. He went to Kansas City, St. Louis, New Orleans, and Chicago. He met many great jazz musicians, like Louis Armstrong. Back in Harlem in 1925, Basie got his first regular job at Leroy’s, a place known for its piano players, where lots of celebrities went. The band usually played without sheet music. He met Fats Waller, who was playing organ at the Lincoln Theater, accompanying silent movies, and Waller taught him how to play the organ. Willie "the Lion" Smith helped Basie out when there was not much work, arranging gigs at house-rent parties, where he met other important musicians. In 1928 Basie was in Tulsa and heard Walter Page and his Famous Blue Devils, one of the first big bands, which had Jimmy Rushing singing. A few months later, Basie was asked to join the band, which played mostly in Texas and Oklahoma. He began to be known as "Count" Basie. In 1929, Basie started playing with the Bennie Moten band, Kansas City. The Moten band was classier and more respected than the Blue Devils. They played in a style called the Kansas City stomp. As well as playing piano, Basie also arranged music with Eddie Durham. When they were staying in Chicago, Basie recorded with the band. He sometimes played four-hand piano and dual pianos with Moten. The band got better when they added a saxophone player called Ben Webster. The band voted Moten out and Basie became the leader. The band was now called "Count Basie and his Cherry Blossoms". Later he went to join Moten's new band. Moten died in 1935 and the band did not stay together. Basie made a new band, which included many of the musicians from Moten's band. Lester Young, a saxophone player, also joined. They played at the Reno Club and sometimes on local radio. One night the band started improvising a piece which Basie called "One O'Clock Jump". It became his signature tune. ↑ Basie, Count (1985). Good Morning Blues: The Autobiography of Count Basie. Paladin Grafton Books. p. 25. ISBN 0586086382. ↑ Robinson, J. Bradford. Count Basie. in Kernfeld, Barry. ed. The New Grove Dictionary of Jazz, 2nd Edition, Vol. 1. London: MacMillan, 2002. p. 155. This page was last changed on 30 August 2017, at 23:40.